One thing I believe we all want is to give the most meaningful gifts possible, any time of the year. The deepest meaning found in Sacred Geometry is how it aligns and returns us to the Divine and teaches about relationships in simple and profound ways. Our relationships can be deepened by the meaning and intentions of the gifts we give, even if the one receiving does not understand a symbols meaning, they can feel the depth of it. Sacred Geometry Portal has just begun to compile resources for those interested or passionate about “the patterns of nature and the cosmos”. So, to help you along with your holiday shopping, here are some ideas, fresh from our Shop. 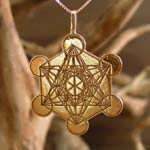 For anyone who considers the jewelry they wear to be much more than something of beauty, but who understand the power of symbols and intention and seek truly exceptional designs, Ka Gold Jewelry is an amazing source of spiritual jewelry that I am honored to share with you. In addition to having an incredibly wide assortment of exquisite rings, pendants, and earrings, Ka Gold Jewelry is the only jeweler I’ve seen who actively seeks new design concepts from customers, and therefore is constantly improving and expanding an already extraordinary product line. Some of my favorite pieces are shown below, but there are so many I love, it’s really a challenge to choose. I am sure you can feel a tremendous positive energetic effect from wearing them, too. 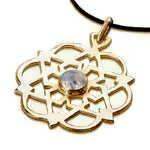 I really like the beauty of these unique pendants and the use of sacred geometry in combination with quality stones to change subtle energy fields for ease of being. 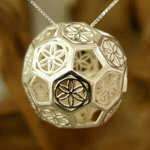 Metaforms has the best quality 3 dimensional Sacred Geometry I have found anywhere. Please click on the image to enjoy browsing their website.